The most obvious answer is avoidance of negative consequences, such as going to jail as Jeffrey and David have done. Negative consequences are a primary means for evolved animals to influence each other. To have a personal sense of ought and empathy is considered normal because most of us have these traits as innate evolved mechanisms that have a net survival benefit for a social species. Individuals who lack empathy are considered pathological. When they commit crimes the rest of us hire people to put them in a cage or sometimes even kill them in social self defense. Jeffrey and David had or have a pathological lack of empathy and thus have a hard time understanding why most of us feel this powerful emotion of empathy, of feeling what other people feel, a sense of ought that is innate to our evolved physiology. There is a practical benefit to we atheists in having sociopaths find Jesus and develop some sense of ought by that means. As irrational and fallacious as it is, people like Jeffrey and David seem to actually believe it and most critically act on it. It is too late for Jeffrey and his victims, but David has at least found some kind of substitute source of empathy and has gone on to do some very productive things with his life as a result, which is vastly better than just locking him up for longer and longer periods as the severity of his crimes continually increases. Sometimes when a particular gland stops producing an important substance we can inject a synthetic substitute, such as insulin. Jesus is David's empathy insulin. I, like most people, have innate empathy. I have an innate sense of ought. Behavior of social animals from ants and bees to flocking birds to herding mammals indicates that mechanisms for "ought" are deeply ingrained in the physiology of evolved social animals, such as homo sapiens sapiens. Thus, the less obvious answer to Jeffery, which David also has difficulty understanding, is that we keep our behavior within acceptable ranges because we have evolved innate empathy and a sense of ought as a mechanism to generate social behavior. Jeffrey and David have difficulty understanding this motivation because they have or had a pathological lack of these innate sensibilities. I have enough empathy to realize this pathology has been a source of a lot of suffering in their lives and wish David all the best in his future endeavors. Hi There. After reading what you shared I found interesting the way you define morality. If what you're saying were true, then morality is nothing more but a biological response controlled by the laws of physics and chemical reactions taking place inside the body, presumably only on living things, but nothing more than that. Therefore how can one blame or punish another living thing, e.g. 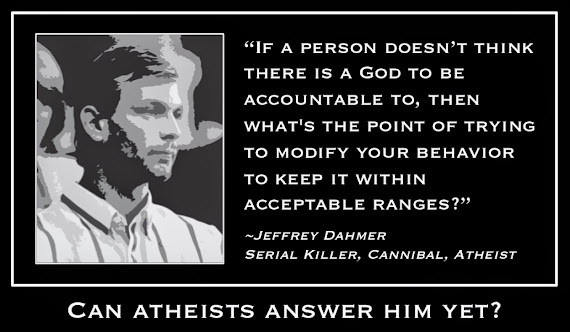 Jeffrey Dahmer, for just simply react to antecedent causes which he can't control after all. He's not accountable for what substances inside his body are produced or stop to produce. By the way I have to point out the fact that you seem to operate under the assumption that there is cause and effect in the universe, because you use the term consequences. In doing so you are borrowing from the Christian-Theistic view of the universe. How can an atheist account for order or disorder in the universe? would be my question. On the other hand you make reference to David's case and others who find an alleged alternative source for morality fueled by emotional power and somehow it influences their behavior. I also noticed you called this alternative source for morality, Jesus, "irrational and fallacious." Do you believe in the laws of logic then? If so are they material in nature? Are the laws of logic universal and invariant or is it your assessment of believing in Jesus as irrational and fallacious just the mere result of electrochemical processes taking place up there in your gray matter inside your cranium? You raise a great many very interesting subjects! I will try to take them in tern and give you substantial responses without being too long winded. I don't blame criminals in the traditional sense, but I do gather together with my fellow citizens in social self defense. Negative consequences are a deterrent to future crimes, and an opportunity for rehabilitation once a crime has been committed. Confinement of a criminal physically prevents most further crimes (gangsters still manage to commit crimes even in prison). I don't blame a predatory animal for attacking me, but I will cage or kill that animal in self defense. There seems to be cause and effect in the universe. I suppose I could speculate that I am god and you are a figment of my divine imagination and the appearance of cause and effect are illusory. But I have no positive evidence for such a speculation so I estimate its probability to be infinitesimal, thus I proceed on the provisional postulate that reality is basically as it seems to be. If I get some positive evidence to the contrary I will modify my postulate accordingly. How existence came to be as it is nobody knows. Adding the speculation of god explains nothing because it is a mere attempt to push the unknown back a layer and assert an answer by ad hoc definition and non-sequitur assertion, which is no answer at all. 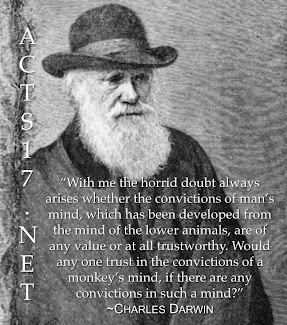 I see no connection to a theistic world view or borrowing from theism in this approach, rather, it is a scientifically minded approach. Why is there order as opposed to disorder? Why isn't the universe an amorphous particle soup? At base, nobody knows. We can apply the anthropic principle, namely that if the universe were disordered we could not exist to ask the question, so of course we find an ordered universe. But that still leaves the fundamental question of how the order came to be unanswered. I don't know David, and I certainly have no special insights into his thought processes, but he has in fact gone from a sociopathic homicidal criminal to a successful father and law abiding citizen so I can reasonably infer that some major change in his thinking has in fact occurred. That change appears to be centered on Christianity. "Laws" are a bit of a misnomer in my view. They are descriptive of perceived relationships under particular circumstances. What we call laws are descriptions of material relationships. To characterize anything as rational, irrational, fallacious, or logical one must first make a series of provisional postulates or axioms. Once we agree to move forward on the basis of those fundamental postulates then we can analyze in terms of rationality. To your last sentence, yes, I think my analysis of Jesus and everything else is a result of electrochemical processes in my brain. Thus David's search for an atheistic answer to Dahmer successfully answered and ended. But let's pretend that theists actually say, "We only believe in being good if God's going to reward us for it." (I've never heard a theist say that, but all Dawkins fans insist it's all we ever say!) According to whose standard would this position be wrong? Is it just your personal opinion? If someone comes along right after you and says it's good to think this way, how will we decide who's right? Shall we judge by your feelings? LOL! basically you think that the godless have no sense of ethics, morals, integrity or value, because being told what is right or wrong, makes the followers more honest or true? i'm sorry but extorting said beliefs and expecting the youth to believe, doesn't, nor has it ever created truth, nor honesty…maybe thats why jeffery here ate people?! hypocrisy consumes us all. the dangerous ones can't see it, because they are the jeffery's yet to be caught, still influencing and manipulating the future. Jeffrey Dahmer was deeply disturbed: her mother had mental issues, and neither of his parents showed him much affection. He was shy and weird, and of course classmates bullied him. He had his first violent fantasies at a young age. He started drinking. Teachers never noticed his personal problems. No one helped him. Basically no one loved him. Soon after high school, his mother moved out of the state and left him to live alone.